Seven years ago, Duke University engineers demonstrated the first working invisibility cloak in complex laboratory experiments. Now it appears creating a simple cloak has become a lot simpler. "I would argue that essentially anyone who can spend a couple thousand dollars on a non-industry grade 3-D printer can literally make a plastic cloak overnight," said Yaroslav Urzhumov, assistant research professor in electrical and computer engineering at Duke's Pratt School of Engineering. Three-dimensional printing, technically known as stereolithographic fabrication, has become increasingly popular, not only among industry, but for personal use. It involves a moving nozzle guided by a computer program laying down successive thin layers of a material—usually a polymer plastic—until a three-dimensional object is produced. The results of Urzhumov's experiments were published online in the journal Optics Letters, and the team's research was supported by the U.S. Army Research Office through a Multidisciplinary University Research Initiative grant. Just like the 2006 cloak, the newer version deflects microwave beams, but researchers feel confident that in the not-so-distant future, the cloak can work for higher wavelengths, including visible light. "We believe this approach is a way towards optical cloaking, including visible and infrared," Urzhumov said. "And nanotechnology is available to make these cloaks from transparent polymers or glass. The properties of transparent polymers and glasses are not that different from what we have in our polymer at microwave frequencies." The disk-like cloak has an open area in its center where the researchers placed an opaque object. When microwave beams were aimed at the object through the side of the disk, the cloak made it appear that the object was not there. "The design of the cloak eliminates the 'shadow' that would be cast, and suppresses the scattering from the object that would be expected," said Urzhumov. "In effect, the bright, highly reflective object, like a metal cylinder, is made invisible. The microwaves are carefully guided by a thin dielectric shell and then re-radiated back into free space on the shadow side of the cloak." Urzhumov said that theoretically, the technique can be used to create much larger devices. "Computer simulations make me believe that it is possible to create a similar polymer-based cloaking layer as thin as one inch wrapped around a massive object several meters in diameter," he said. "I have run some simulations that seem to confirm this point." 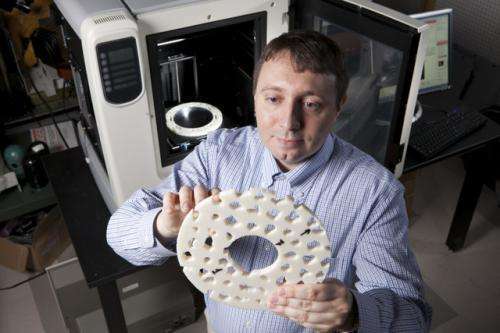 So, now you can get an invisibility cloak by printing a frisbee in 3D. Wow! I guess I need to buy a 3D printer, too. Print a car using a 3D printer, and it can fly, or so we are led to believe. Print a doll, and it gets a soul! My apologies for not being entirely exhilarated, yet. I think you should rather apologize for completely misunderstading the content and impact of the article. "...researchers feel confident that in the not-so-distant future, the cloak can work for higher wavelengths, including visible light." I think you meant higher frequencies or lower wavelengths. but you cant see out of the windows for the plastic ball you are encased in. A proof of concept that works only for microwaves? This will be impressive if humanity spontaneously switches to only being able to see in that spectrum. The title makes it sound like you can just print yourself something that's OPTICALLY invisible. The word "invisible" refers to VISIBLE LIGHT. When I can print an OPTICAL invisibility cloak with what... PVC? PLA?... sure, that will be impressive. Something that just bounces radio frequency around in useful ways is not news. A proof of concept that works only for microwaves? That it works at all using an off-the-shelf 3D printer is pretty amazing. Until now research (and potential applications) were limited to highly specialized labs/factories. This can make the benefits available for all kinds of uses. Something that just bounces radio frequency around in useful ways is not news. It's useful and it's news. Especially science news. If YOU have no use for it then that is the subject for a different site only (your blog or homepage or whatever). But don't pretend like you have even an inkling of knowledge in this area that would allow you to decide what is useful or not. It's useful and it's news. The statement "something that just bounces radio frequency around in useful ways is not news" is correct. The technology to do that is decades old. My main issue with this article is that the title says "invisibility" when the object he's holding up is quite visible. The statement "something that just bounces radio frequency around in useful ways is not news" is correct. Well then you missed the point of the article: It doesn't just 'bounce radiowaves around'. It bounces them around in a highly specific manner that was, up until now, reserved for highly specialized/expensive setups. And that has now become available for manufacture by anyone who is willing to buy a 3D printer for a couple bucks. That's a pretty big advancement (and news). My main issue with this article is that the title says "invisibility" when the object he's holding up is quite visible. As in the dictionary definition: visible: capable of being perceived. Sorry for harping on you like this, but lately there's been a lot of posts of people complaining that a word in the article doesn't mean what they think it should mean. But instead of going to wiki-friggin-pedia and looking it up they insist that their narrow/inapplicable definition is correct and all of science please dumb down/rewrite their articles so that no one, ever, has to get off their lazy butts and learn one more word. God forbid that people actually LEARN something from reading science articles!